Surely there is a better way of doing this? This kind of thing does not come across well as a user of the site. At first blush it looks like malicious sockpuppetry. Now it just looks like I'm being penalized for some long-after-the-fact policy change, relating to a posting (i.e. : the question) that wasn't even mine. Answered 4 years ago, then 2 downvotes in 2 days... weird... but why? From here. That comment is 18 hours old at time of writing. On an answer that had just two upvotes. 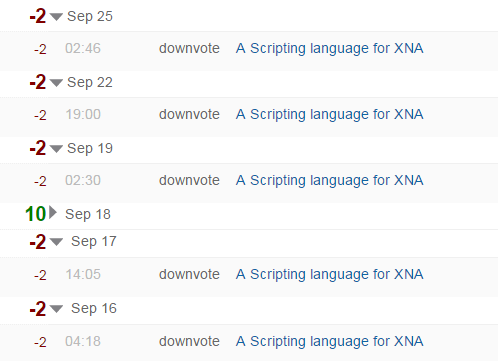 If you're downvoting questions because they're lazy / poorly-written / useless, more power to you. If you're downvoting answers because they're lazy / poorly-written / wrong / useless, good on ya. But blindly downvoting answers to avoid... retagging? That's just wrong. Voting to delete? The number of votes required to delete questions is capped at 10 - but in this case it would've only required three. Triggering automatic deletion? Guessing that giving folks with 125 rep the ability to delete questions with upvoted answers ain't gonna fly, so that just leaves #2: make questions with recent voting activity (on the question or answers) ineligible for auto-deletion for some hefty period of time. Even though I am not one of the 6 downvotes on this answer, this is my fault. (I am the original author of that cleanup status post). I have personally encouraged this sort of behavior in the past, been told to stop (and have personally stopped), but failed to properly educate my friends to not resort to this sort of behavior on highly upvoted answers. As a Room owner of SO Close Vote Reviewers, I feel personally responsible for this behavior and I will (and have already) take steps to ensure this does not happen again. No one here appears to be arguing that the question is on topic. In fact, the very first thing that happened after this Meta post was made was for the question under discussion to be mod deleted. When a question is deleted by the roomba, all reputation loss for the downvotes is immediately refunded. Again, I completely agree that large, organized voting efforts for deletion of old questions is bad. But I also think that changing the roomba rules is a harsh overreaction, especially when we know exactly who the people are that are doing this, and groups of people doing this happen extremely infrequently. It's not many groups of people are doing this all over the site. We made a mistake here, absolutely no question. But we can fix it, @Shog already has fixed it, and we can educate the people doing it (who do listen) to stop doing it. Please give me a chance to handle this on my end before making it significantly more difficult for our well intentioned cleanup efforts to proceed. I have created a pin to begin the effort of explaining this to the users of our chatroom. Not the answer you're looking for? Browse other questions tagged discussion downvotes burninate-system . Why does the user-experience tag exist?